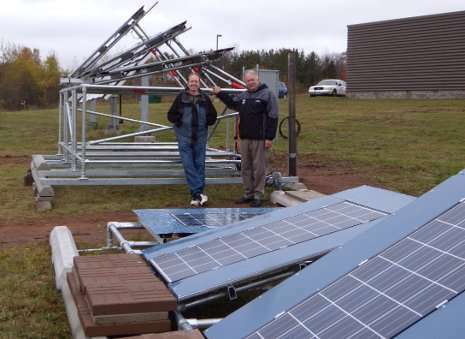 Solar energy scientist Joshua Pearce, left, and Jay Meldrum, director of the Keweenaw Research Center, with the array of solar panels behind KRC. Even on this gloomy day, they were cranking out electricity. Michigan Technological University's Keweenaw Research Center (KRC) is now part of a two-year study that will help answer that question. The aims are to gauge how snow affects solar panels' power generation and determine the best ways to overcome any losses. The international engineering firm DNV GL, which specializes in large energy- and sustainability-related projects, has built an array of solar photovoltaic panels behind KRC, each set at a different angle, from 0 degrees (flat) to 45 degrees. "If you tilt them at 60 degrees, almost no snow sticks to the panels, but you also lose a lot of sunlight when they are not facing the sky," said Tim Townsend, a principal engineer for solar services with DNV GL. Based on similar studies, year-round losses can be anywhere from a few percent (as found by Michigan Tech in a study looking at Ontario data) to 12 percent (39 degree tilt) to 18 percent (0 degree tilt), which Townsend measured near California's Lake Tahoe. Townsend's group developed a model to predict how snowfall and other related variables would affect energy generation. Now, they will test their model in collaboration with Michigan Tech using data from the KRC solar array and other test sites in Colorado, Pennsylvania and California. A small variance in power generation may not make a big difference for a homeowner with solar panels. However, it's a big deal in industry. "We do predictions on behalf of commercial lenders being asked to foot the bill for big solar arrays," said Townsend. Good data "makes them more financeable." Eventually, the study results will be publicly available through the KRC website and through solar energy simulation programs provided by the US National Renewable Energy Laboratory. "Everybody who wants to develop solar energy in snowy climates on a large scale will need this data," said Joshua Pearce, an associate professor of materials science and engineering/electrical and computer engineering at Michigan Tech, who is participating in the project. "In the olden days, you'd only see solar farms in places like Arizona, and Spain. Now, large solar installations are found throughout the northern US and Canada." Meanwhile, KRC plans to apply the lessons learned from the test solar panels in its own back yard. "Michigan Tech will be going full bore on stopping snow losses," said KRC Director Jay Meldrum.